Paste the Data Preparation Script, and execute it. Paste the two code snippets transaction1 and transaction 2 in separate query windows. You will notice that this step3 is still executing. Why? We will analyze this later in the post. Transaction (Process ID 65) was deadlocked on lock resources with another process and has been chosen as the deadlock victim. Rerun the transaction. So now let us replicate the scenario again, by running the above steps1 and 2. In the new query window (again a new Query window 🙂 ) Run the below script to understand what locks are placed on the tables pages and rows. When you execute this you can find that each session has created exclusive lock (X) on the row level and intent exclusive (IX) locks on the page and table level. Let’s find what exactly those rows are. Copy the resource_description values for resource_type RID to the below script and run it. This would output the rows that we updated in respective transactions. Now run the step3 in transaction1, and run the script-d pasted above. You will notice that transaction1 now has the new lock for RID 1:156:2 which is in waiting state. In order to find out the row for which transaction 1 is waiting copy the resource_description values to the below script and run it. So transaction1 is waiting for exclusive lock on row ID 3 to be released. But in no way we are referring to rowid3 of transaction1., we were actually referring to row ID 4. Why is SQL Server waiting for this row? 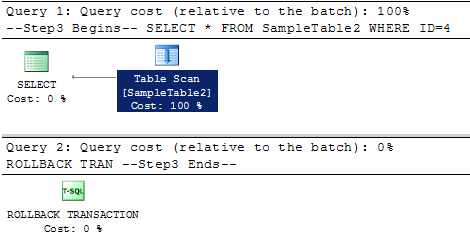 You will find a table scans in the execution plan. So this table scan is forcing SQL Server to actually scan all the rows in the table(for ID=4) , as the ID=3 is blocked by transaction 2 it is waiting for transaction 2 to actually complete in order to take shared lock on the row and compare its value with 4. Similarly when step4 is executed it is blocked by transaction 1, as step 4 has to do a table scan on the table SampleTable1 for ID = 5, but the transaction 1 has exclusively locked the row ID = 1. As both transactions would stay for infinite time blocking each other. 1. Change to Snapshot Isolation. Now if you run the above Dead Lock Scenario steps you will notice that the deadlock is not occurring now. 2.Create index on the table so that there will be alternates for Table Scan. Script to Create clustered indexes on tables. Now if you run the above Dead Lock Scenario steps you will notice that the deadlock is not occurring now. But you can reproduce dead lock if you force SQL Server to do an index /table scan instead of index seek. Using WITH (INDEX (0)) hint in Step 3 and Step 4.